Trailblaze [treyl-bleyz] (verb): To be a pioneer in (a particular subject, technique. etc). For Christians, the trailblazers of faith are those who stepped out in courage, who inspired faithful acts and who found strength in the darkness. Each of us can name someone who inspired our faith, from the courageous political acts of William Wilberforce to the creativity of Patricia St John and the compassion of Amy Carmichael. The trailblazers biography series for children celebrates the lives of these noted Christians, bringing their inspiring stories to a new generation, showing them how God can work in their life today. 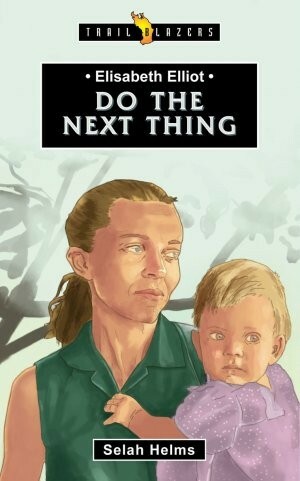 Elisabeth Elliot: Do The Next Thing - The story of an inspirational woman who courageously worked through grief after the tragic death of her husband, Jim Elliot, to become a notable writer and public speaker. Dietrich Bonhoeffer: A Spoke in the Wheel - An exciting and exhilarating story of the World War 2 hero who found strength within the darkness of Nazi Germany, preaching God’s word fearlessly and plotting to overthrow the regime, an act he was eventually martyred for. Wilfred Grenfell: Courageous Doctor - The engaging true story of Christian explorer and mission doctor who was devoted to God. He devoted his life to the betterment of living conditions in 19th Century Labrador, Canada, including the introduction of hospitals, schools and orphanages. William Tyndale: The Smuggler’s Flame - Young readers will discover the astounding story of how the English Bible came to be in this captivating story of adventure, danger and smuggling. The Trailblazers series also covers the inspirational lives of Billy Graham, Eric Liddell, Joni Eareckson Tada, Gladys Aylward and many many more.